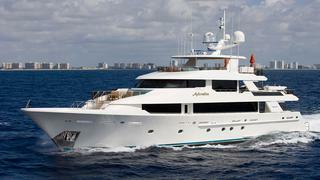 The 39.62 metre Westport tri-deck motor yacht Aphrodite has been listed with Northrop & Johnson. Brokers Kevin Merrigan and Wes Sanford are handling the sale. The Westport 130 is a popular model from the US builder, providing a combination of comfort, function and timeless design. Aphrodite, a 2009 model with only one previous owner, exemplifies classic Westport lines and is an exceptional mix of style, performance and space. She has five staterooms, including an on-deck master stateroom, accommodating up to 10 guests. Her on-deck master has a king-size bed and en-suite bathroom. Below deck aft, two VIP staterooms offer king-size beds and two twin staterooms are located forward. All the lower-deck accommodation has en-suite bathrooms. Her interior features raised-panel mahogany wood and marble, granite and onyx accents throughout. Her main salon and skylounge have large windows that afford large amounts of natural light. The three exterior decks make excellent use of the space, providing several dining locations, an outside gym, tender and toy storage, sunbathing areas and a Jacuzzi. Port and starboard stairwells provide easy access to a large swim platform and the full walk-around decks allow for ease of access for passengers and crew. The GRP-hulled Aphrodite has two MTU diesel engines that sees her able to cruise at 20 knots and go flat out at 24 knots. Her Zero Speed stabilisers ensure maximum comfort at anchor as well as an enjoyable ride at any speed. Aphrodite has ABS classification and MCA certification and an extended engine warranty until August 2017. She has never been chartered and will be on display at the 2015 Fort Lauderdale International Boat Show next month between November 5-9. She is listed at $15,495,000.